In 2011, Khalid Malik was appointed Director of the Human Development Report Office at the United Nations Development Program (UNDP). Prior to his current appointment, Mr. Malik served as UN Special Adviser to Africa on New Development Partnerships. Mr. Malik has been involved in numerous UN studies; he was the lead author of the 2004 UNDP Development Effectiveness Report and co-edited two reviews, one on Lessons Learned in Crisis and Post-Conflict Situations and one focusing on Capacity for Development. From 2003-2010, Mr. Malik acted as the UN Resident Coordinator in China. During this time, Mr. Malik co-hosted the International Finance Forum with Cheng Siwei, the Vice Chairman of the 10th People’s Congress of China, and helped to establish the International Poverty Reduction Centre in China. His latest book, Why China Has Grown So Fast for So Long (2012), draws on this expertise. In 2009, Mr. Malik was selected by the Chinese government as one of ten “champions” for environmental protection in China. Mr. Malik has also served as the Director of the UN Evaluation Office and the UN Representative in Uzbekistan. Before joining the UN, Mr. Malik held teaching positions at Oxford’s Pembroke College and the Pakistan Institute of Development Economics. Born in Pakistan, Khalid Malik earned his B.A. at Punjab University and two M.A.s in Economics from Cambridge and Essex Universities. What is he known for, and what can we expect from him, going forward? Khalid Malik is known for his expertise on economic growth in China, climate change and the environment, science & technology, and data-driven development. For Mr. Malik, the purpose of development is not merely to increase incomes but to expand the choices and freedoms for all. 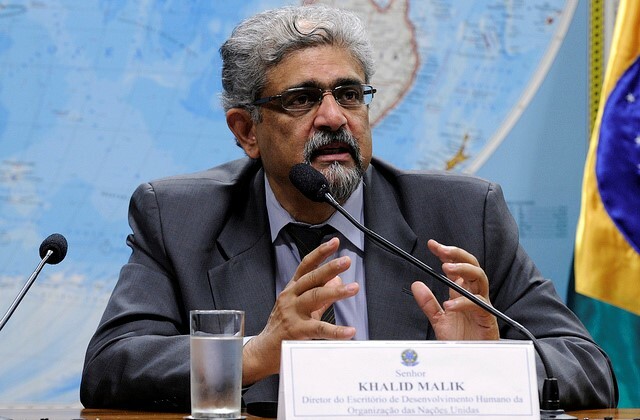 Mr. Malik is currently responsible for producing the UN’s Human Development Report, which evaluates the choices and freedoms available to people from around the world. Last year’s Human Development Report was titled The Rise of the South, and highlighted an upward trajectory in human development. Mr. Malik has been quick to emphasize that these trends are broader than just the BRICS, with over forty countries displaying remarkable levels of improvement. The 2014 Human Development Report: Sustaining Human Progress was released yesterday in Japan. Commensurate with Mr. Malik’s overall approach to development, the report will focus on ways to build human resilience and reduce human vulnerabilities. The challenge will lie in determining the policies to reduce the persistent issues the not only keep many people in a vulnerable position but also threaten to reverse progress already made in human development.